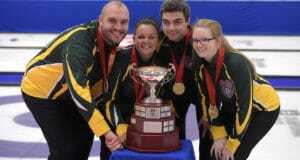 Canada’s Trevor Bonot and his Northern Ontario team of vice-skip Jackie McCormick, second Kory Carr, lead Megan Carr and coach Jim Waite are the 2017 World Mixed Curling silver medallists after losing the final to Scotland’s Grant Hardie 8-5 on Saturday at the World Mixed Curling Championship in Champéry, Switzerland. 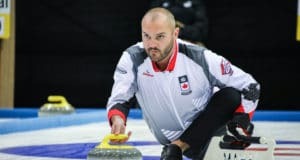 Team Canada’s Trevor Bonot cruised to a 9-1 win over Russia’s Alexey Stukalskiy in quarter-final action at the World Mixed Curling Championship in Champéry, Switzerland this afternoon and will move on to tomorrow’s semifinal. 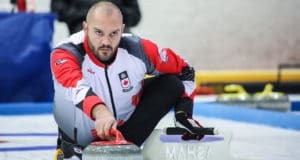 Team Canada took an early lead and hung on for a 4-3 win over Poland in the first round of playoffs today at the World Mixed Curling Championship in Champéry, Switzerland. 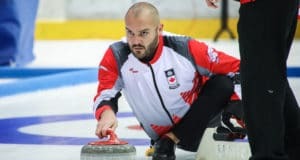 Team Canada’s Trevor Bonot is headed to the playoffs after cruising to a 5-2 win over Germany’s Andrea Schoepp and wrapping up the round robin strong – not to mention, undefeated – at the World Mixed Curling Championship in Champéry, Switzerland. Team Canada notched a 5-3 win over Poland on Sunday morning to remain undefeated at the 2017 World Mixed Curling Championship in Champéry, Switzerland. Teams attending the 2017 World Mixed Curling Championship, beginning Friday in Champéry, Switzerland, should prepare to hear the occasional moose call inside the Palladium de Champéry.